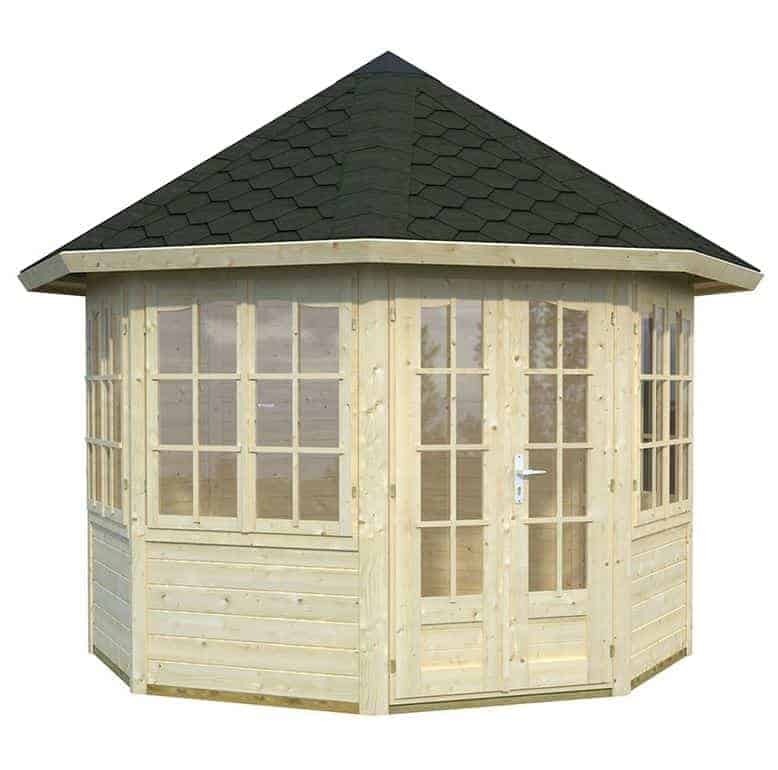 One of the things we like most about log cabins is that they come in many shapes and designs, but we particularly liked the octagonal shape of this well sized log cabin from Palmako. It not only catches the eye, and is sure to impress friends and neighbours, it also fits easily into a corner, making it a perfect option for those with small or shallow gardens. 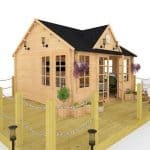 This log cabin brings a lot of benefits to a garden, one of which is that it’s a great place to relax, especially if you fill it with your favourite furniture and entertainment systems. The two windows let lots of light flood the interior, and because they’re double glazed they keep external noises out. They can also be opened to create a cooling atmosphere on a hot summer day. One of the stand out features on this log cabin is the thick and durable cladding used. It not only looks good, it’s very strong and stable too so you won’t have to worry about it being positioned in areas that are exposed to high winds. With the help of the bitumen roof, it also keeps rain and snow out. It’s one of the reasons that a 5 year structural guarantee is provided. We’ve reviewed lots of log cabins, but few of them have the striking good looks we found on this octagonal apex roofed cabin. The eight sides catch the eye, but they’re also practical as they create a spacious interior while still making it easy to fit the log cabin into a corner where space is at a premium. It means that people with gardens of all sizes can now enjoy the benefits that a well built cabin can bring. 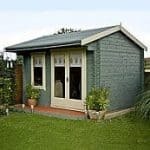 It’s a very versatile building, and can be used as a guest room, an entertainment lounge, or simply as a space that you can relax in as you look out at the garden. The first thing that caught our attention was the roof, as it’s not only made of tough tongue and groove cladding it’s then covered in bitumen shale. This isn’t something that we often see, and creates a very durable substrate that looks highly attractive. As well as repelling water it also adds height, giving a ridge height of 3.10m and an eaves height of 2.15m. The overall width and depth of the cabin are both 2.89m, so there’s lots of room inside to be utilised. We’re used to seeing log cabins that have thick cladding, and this is an important factor in creating all-weather stability. We were particularly impressed by the interlocking log cladding found here, however, as its thickness of 44mm is almost double that of most that we find. The timber used, Nordic pine, is also renowned for its toughness, so the end result is a garden building that’s very strong and reliable. The floor shares the same properties as the roof, in that it’s made of 19mm thick tongue and groove cladding. We always like to see tongue and groove used for the floor, as opposed to cheaper solid sheet material, as this makes them strong enough to withstand the weight of furniture upon them. At this price we would expect to see pressure treatment used on the timbers, as this gives them long lasting preservative qualities. Unfortunately no treatment has been used on this occasion, which means that although the pale timbers look attractive initially, they can quickly fade with the sun, or take on the discolouration caused by rot. To protect against the eventuality, the owner will need to add their own wood preserver treatments immediately, and it’s important that they also apply further treatments every year afterwards. A knock on effect of this lack of initial treatment is that no extended warranty is provided against rot, although a five year structural guarantee is given. At a price that’s in excess of two thousand pounds, we would have liked to see an anti-rot warranty of at least ten years. The fully glazed doors are just one of the features on this log cabin that we found to be highly decorative, but just because they look good doesn’t mean that they don’t perform well. Whilst their width of 0.97m is narrower than many that we see, in conjunction with a door height of 1.74m it’s still easy to manoeuvre objects in and out. We really liked the two windows, and not only because they let lots of light inside and can both be opened to allow ventilation in. The double glazing used is very effective at keeping noise out, and that’s also because they’re fully ledged and laminated. It also means that they’re very good at keeping heat in, which is especially welcome on sunny yet cooler days. The double glazing not only helps to create a pleasant environment within the log cabin, it can also help to keep potential intruders out as the toughened glass is much harder to break through. That wasn’t the only security feature that we welcomed, as we were pleased to see that the double doors featured a secure and sturdy key operated lock. It’s a strong and reliable locking system, which is just what top end log cabins such as this need. One extra that we would highly recommend is a supply of good quality wood preserver, and although it’s really more of an essential than an optional item it will have to be sourced separately by the customer. An extra that can be purchased with the log cabin, however, is a professional installation service. Even though we feel that this is rather expensive at £654, we can imagine many people opting for it to save time and ensure a perfect and trouble free assembly. Palmako are log cabin specialists, and we always find high quality components in their buildings. As the use of thick logs shows, we weren’t disappointed on this occasion. Whilst the thick cladding offers some protection, we would have expected to see a long lasting preservative used by the manufacturer to give added durability. 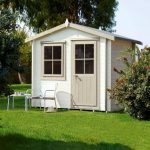 Thanks to the very tall roof, among the tallest we’ve seen on the log cabins we’ve reviewed, this offers lots of room inside. 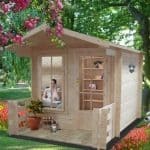 We were pleased to see that this cabin has a modular design, meaning that you and a friend can complete the installation in as little as six hours. 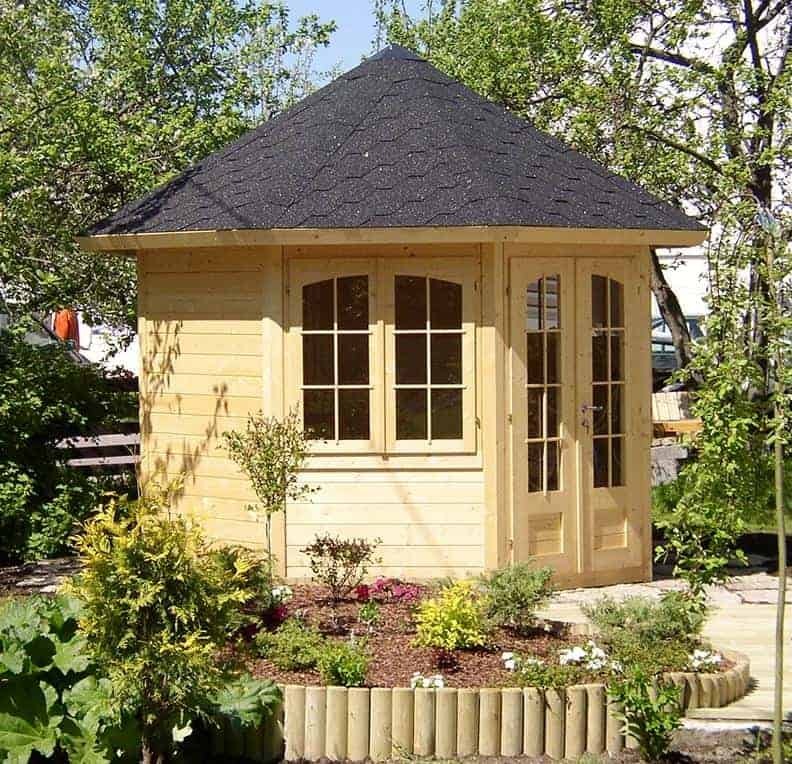 We liked the look of this log cabin, and it’s features, but with no anti-rot warranty supplied there are more cost effective options available. 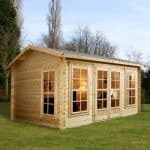 Final Thoughts: Lots of people like the idea of having an attractive and roomy log cabin in their garden, but they’re put off by a perceived lack of space on their property or worries about having the time or ability to complete the self-assembly. This Veronica log cabin addresses both these concerns. Its octagonal design fits easily into corners, and it’s surprisingly easy to assemble, even without taking advantage of the optional installation service. We feel this will brighten up any garden, particularly if a coloured preservative treatment is used to customise it as well as to protect it from the threat of wet rot.